The 1.642-L (100.2 cu in.) displacement, liquid-cooled 3TNV88F-EPJT1 Yanmar® diesel engine provides 18. kW (24.4 hp) to the 3025E. The 1.642-L (100.2 cu in.) displacement, liquid-cooled 3TNV88C-NJT Yanmar diesel engine provides 22.9 kW (30.7 hp) to the 3032E. The 1.568-L (95.68 cu in.) displacement, turbocharged, liquid-cooled 3TNV86T-NJT Yanmar diesel engine provides 27.4 kW (36.7 hp) to the 3038E. The engine uses the latest technologies to optimize fuel economy, improve control and accuracy, and reduce environmental impact. The common rail system (CRS) optimizes fuel economy and reduces operating costs*. High-pressure injection atomizes fuel into finer particles which burn more completely. It results in improved fuel economy and a lower cost of operation. 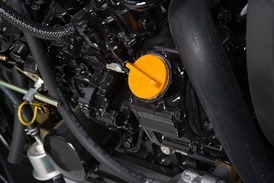 The engine comes with an after-treatment system. The system operates automatically. The exhaust filter consists of a diesel particulate filter (DPF) which captures particulate matter (PM) contained in the exhaust gas. 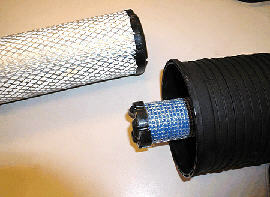 Using a natural cleaning process, most of the PM trapped in the exhaust filter is eliminated by the heat of the exhaust stream generated by normal use. In situations of low temperature, engine speed, or load factor, an active cleaning cycle is initiated. 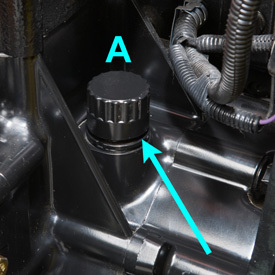 In this cleaning cycle, the exhaust gas temperature is raised by injecting additional fuel during the exhaust stroke of normal vehicle operation to the diesel oxidation catalyst (DOC). *NOTE: As compared to engines not using CRS technology. To achieve the required conditions, exhaust temperature management (ETM) manages the initiation and duration of active filter cleaning. ETM can adjust numerous engine parameters and/or inject a small quantity of fuel into the exhaust stream for a short duration. The fuel turns to vapor and chemically reacts with the catalysts in the DOC to create heat to oxidize the PM. In some instances where passive and active filter cleaning have not fully cleaned the PM from the system, a parked filter cleaning may need to take place. In general, the only time a parked filter cleaning will need to occur is when automatic filter cleaning has been disabled for an extended period of time and multiple warnings to engage filter cleaning were ignored or if the tractor has been used during light load conditions. Additionally, when the automatic filter cleaning process has been deliberately interrupted multiple times, or if active filter cleaning has failed numerous times due to a failed component, a parked filter cleaning may be requested. In these rare instances the operator will have to park the tractor and start the filter cleaning process. The parked filter cleaning process needs to be activated based on usage and operation of the tractor. The process will take approximately 30 minutes. See the operator's manual for more details. This system constantly monitors the soot level of the tractor; making sure the tractor is always in peak performance condition. This ensures high performance at all times. NOTE: Number of hours since last regeneration and soot level percentage are viewable on LCD display. 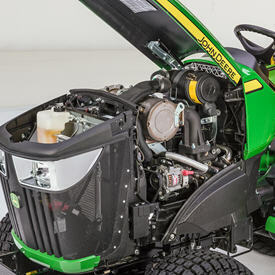 Easy access to engine check and fill points on the right-hand side of the tractor by removing the side panels. The 3E Tractors are available with a two-range hydrostatic transmission (HST) incorporated in a die-cast aluminum transmission case. Fluid under pressure transmits engine power to the drive wheels via a closed-loop pump and motor arrangement. 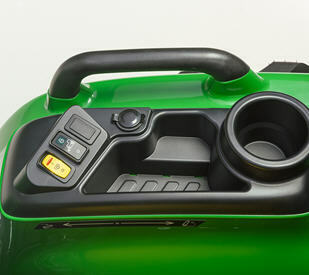 Infinite ground speeds allow the operator to match the speed of the tractor to the job. 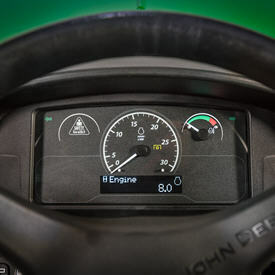 Key John Deere advantage - John Deere's Twin Touch foot controls offer several key advantages over competitive HST models tractors. 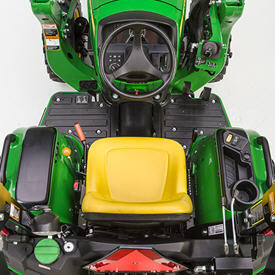 The 3E Series Tractors can be outfitted with an optional cruise control switch that is installed on the right-hand control console. 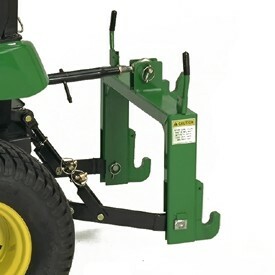 This gives operators the ability to keep a constant speed when in transportation, field mowing, or other applications where extended use of the transmission is needed. This kit is very quick and easy to install for those who desire this feature. 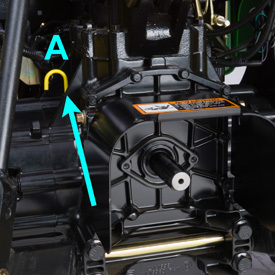 Easy-to-reach transmission fill point (A) located on top of rear axles on the right-hand side. An uncluttered design gives operators of all sizes plenty of room to be comfortable. Color-coded controls are located on either side of the operator. 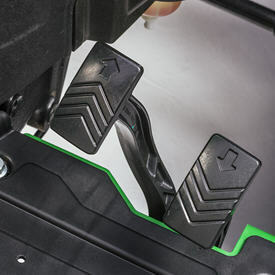 Hydrostatic transmission (HST) and brake pedals are designed and located for maximum comfort and ease of use. 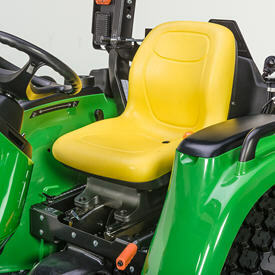 Contoured, comfortable seat enhances operator comfort. Seat flips forward for protection from the elements. 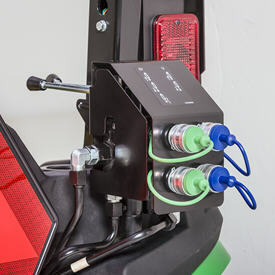 Flat operator platform provides for easy entry to/exit from the tractor. Folding Roll-Gard™ rollover protective structure (ROPS) and retractable seat belt increase operator safety. 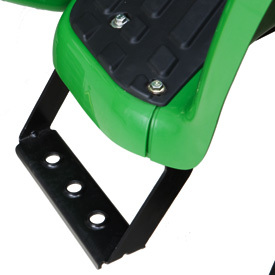 The left-side step allows for easy access on and off the tractor. Foot platform has a non-skid surface for sure footing. The thick, soft padding on this seat provides a smooth and comfortable ride. Adjustable using the fore and aft lever located under the seat, the seat slides on ramped rails to provide comfortable access to all controls. 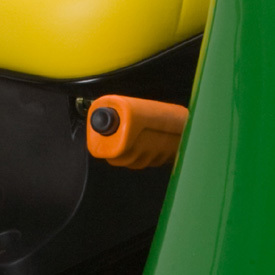 All 3E Series Tractors come standard with a fuel gauge that is easy to read from the operator's station, to ensure operators do not run out of fuel. OPS requires the operator to be in the seat to operate the transmission or PTO. ROPS is designed to meet or exceed American Society of Agricultural and Biological Engineers (ASABE) safety standards. Reflective ROPS strips for better tractor visibility. 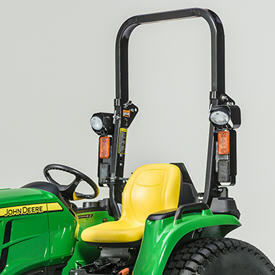 Seat belts are in base equipment on all John Deere compact utility tractors. Key switch interlock prevents bypass starting. Visual PTO warning light on the instrument panel alerts the operator when the PTO is running. Turn signal and flashing warning lights operate according to ASABE standards. Slow-moving vehicle (SMV) sign is provided for road transport. Automotive hand-style park brake for easy on/off. Instrument panel has an indicator light for the park brake. 3E Series Tractors are equipped with Roll-Gard ROPS. These folding ROPS meet the ASABE standards for compact utility tractors. Overall height is 244.3 cm (96.2 in.) with R3 tires, 242.1 cm (95.3 in.) with R4 tires, 244.6 cm (96.3 in.) with larger R4 tires, and 244.9 cm (96.4 in.) with R1 tires. With the Roll-Gard ROPS folded down, producers can easily to get their tractor into a garage with a standard 2.1-m (7-ft) garage door. NOTE: The use of seat belts is recommended at all times when operating the 3E Series Tractor with folding ROPS. An optional canopy is available to help protect the operator from the elements. 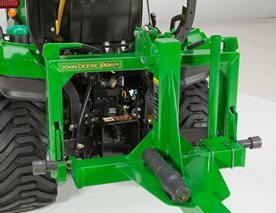 3E Series Tractors can be equipped with a field-installed rear hydraulic remote kit, providing two additional hydraulic spools on the back of the tractor. 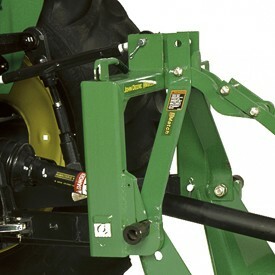 This kit can be field installed on a tractor with a loader or without a loader. This versatile kit gives 3E Series Tractor operators the options they desire for putting their tractors into a wide range of tasks. The first spool is equipped with a float position, giving the operator the ability to contour the landscape and improve the final grade with certain implements. NOTE: Neither of the spools in this kit are equipped with a detent position; therefore, they should not be hooked up to anything with a motor, as the valve was not designed to be run open. 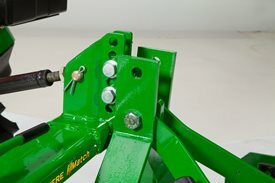 The kit is designed for momentary, on-demand hydraulic flow such as moving a cylinder. The approximate installation time is 1 hour to 1.5 hours. 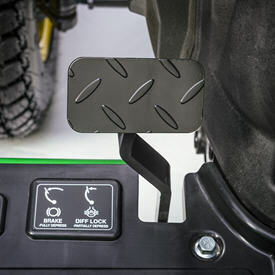 Gas-lift hood support eliminates the need for a mechanical prop rod. How tough are they? See what happens when you drop a 16 lb (7.28 kg) Shot Put on one of our polymer hoods in minus 20 degree F. (minus 28.89 degrees C) temperatures. Don’t do that with a metal hood. on New John Deere 3 Series Compact Tractors. 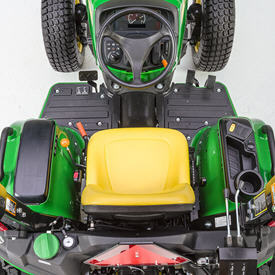 on New John Deere 3E and 3R Series Compact Tractors.